Preheat the oven to 170°C (150°C for fan oven). Place the hazelnuts directly onto a baking tray and toast in the oven for 20 minutes. While the nuts are toasting, put the caster sugar in a heavy bottomed saucepan and heat over a medium heat until it melts. Watch it constantly so that it does not burn. 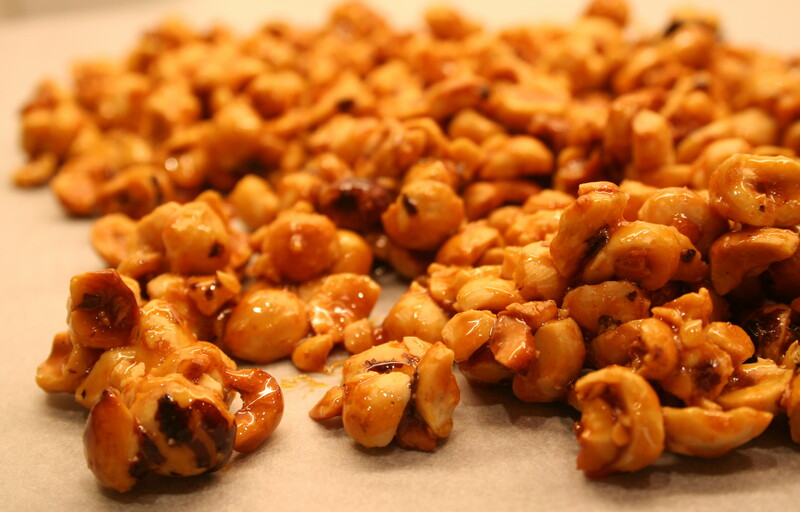 As the sugar begins to turn golden and caramelise, add the hazelnuts and stir to coat them in the syrup. Continue stirring over a medium heat until golden brown. Pour the mixture out onto a baking tray lined with grease proof parchment and allow to cool. Break the solid mass of nuts into chunks, place in a food processor and pulse blitz to desired chunkiness or powderyness. I blitzed mine until quite fine – ensuring I didn’t over blitz it as this will then turn from powder into paste. Alternatively you can bash them with a rolling-pin.